MDPI Special Issue Special Issue on the 2017 International Image Sensor Workshop (IISW) publishes Olympus paper "Multiband Imaging CMOS Image Sensor with Multi-Storied Photodiode Structure" Yoshiaki Takemoto, Mitsuhiro Tsukimura, Hideki Kato, Shunsuke Suzuki, Jun Aoki, Toru Kondo, Haruhisa Saito, Yuichi Gomi, Seisuke Matsuda, and Yoshitaka Tadaki. 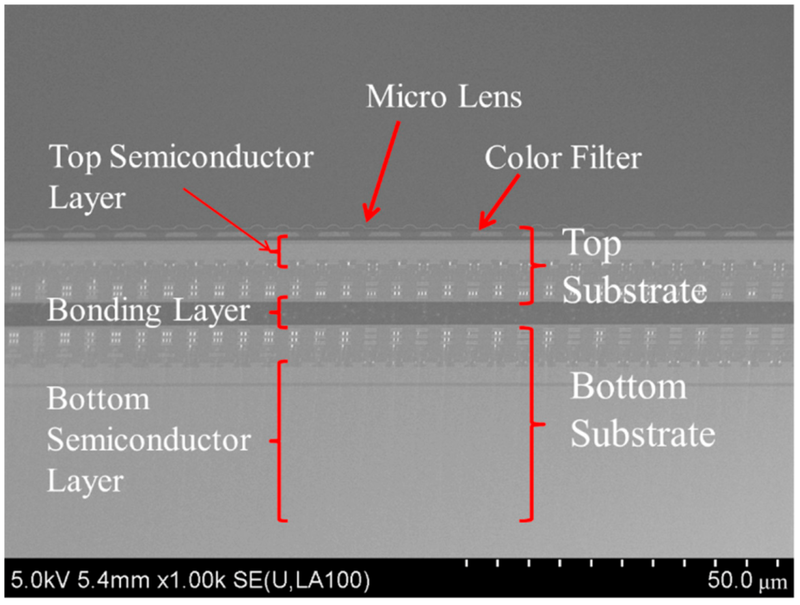 "We developed a multiband imaging CMOS image sensor (CIS) with a multi-storied photodiode structure, which comprises two photodiode (PD) arrays that capture two different images, visible red, green, and blue (RGB) and near infrared (NIR) images at the same time. The sensor enables us to capture a wide variety of multiband images which is not limited to conventional visible RGB images taken with a Bayer filter or to invisible NIR images. Its wiring layers between two PD arrays can have an optically optimized effect by modifying its material and thickness on the bottom PD array. The incident light angle on the bottom PD depends on the thickness and structure of the wiring and bonding layer, and the structure can act as an optical filter. Its wide-range sensitivity and optimized optical filtering structure enable us to create the images of specific bands of light waves in addition to visible RGB images without designated pixels for IR among same pixel arrays without additional optical components. Our sensor will push the envelope of capturing a wide variety of multiband images." 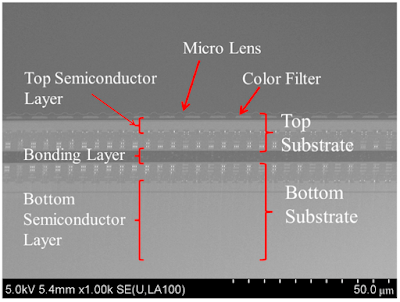 Concept of multi-storied photodiode CMOS sensor based on 3D stacked technology. There are two layers of PD arrays, one in the top and the other in the bottom semiconductor. The top PD array converts a part of incident light into signals and works as an optical filter for the bottom PD array. The bottom PD array converts light that penetrates through the top substrate into signals, which means the top substrate acts mainly as a visible light sensor and the bottom one is an invisible IR light sensor.